Return to the enchanting world of Oz with Dorothy and her pals! L. Frank Baum's ever-popular tale springs to life with this colorful collection of fifteen beloved characters and twenty-three costumes. 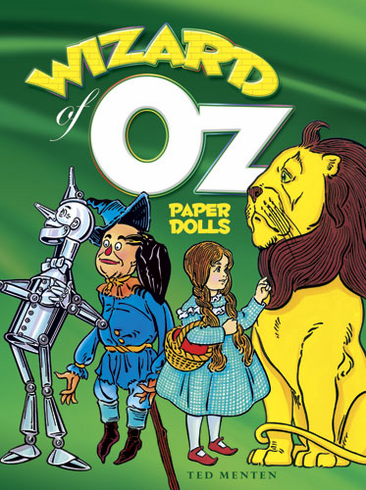 Based on the original W. W. Denslow art, the dolls include Dorothy, her dog Toto, the Tin Woodman, Scarecrow, and Cowardly Lion, as well as other denizens of Oz Ñ witches good and evil, winged monkeys, and of course, the Wizard himself! Dress them up, re-create the fun and frights they encounter along the yellow brick road, and let your imagination go over the rainbow. This tribute to an all-American classic is sure to delight generations of paper doll enthusiasts and memorabilia collectors. Author/Editor: Ted Menten. 32 pages. Dimensions: 8-1/4 x 11.